I love my RX-8 and here's why. This is what happened today and it goes with some of the threads over the last couple of weeks. I own a Neon R/T. I've had it for two years now. I know this car, and I can say that it does not compare to my RX-8 . The interesting part about today is, I have a friend that owns an SRT-4. I saw him today at church and afterwards, he was really wanting me to take his car for a spin - he is so proud of it. He has even installed a newer, "faster" better chip for it. I was not pushing to drive the thing since I was visiting with so many people. He wanted my opinion and gave me the keys and insisted I drive it before going inside and eating with everyone else. I thought "okay, I'll give it a whirle". I went through town getting a chance or two, to accelerate quickly. You really have to hold the wheel because the tires want to pull from side to side, being front wheel drive. I got on the freeway and on the loop back to the church I got it up to about 120 for a moment. The car has more power than my RX-8........but I can tell you, the RX-8 is "refined". The whole feel of the RX-8, when cornering is phenomenal!!. The SRT doesn't even come close. Yeah, SRT is like an R/T that is more powerful...but it's still just a Neon. I think my perspective is different than most since my Neon R/T was the "nice car" in the family, before the RX-8 showed up (replacing the cool Geo Metro 4-door 3-speed AT). I am very familiar with the Neon and now the RX-8, and the difference between these two cars: the RX-8 wins hands down. It is so smooth to be driving so fast, effortlessly; and when it is so quiet too. My Neon is just noisey. The way you sit in the car is completely different than a Neon. Your down low; not sitting on a couch stool or something. What I kept noticing today was how quick I was at 6K on the SRT and the car would start to limit any higher revving. The 8.5K+ on the RX-8 is addictive and becomes the standard of what you'd expect all cars to be able to do; I just love that long powerband curve. It is soooo nice to feel and hear. Mazda - you've done a great job making a car work around the rotary engine. Thank you for continuing to bring us this unique piece of machinery to enjoy. Last edited by QuantumTheory08; 08-24-2003 at 03:12 AM. Mark, I echo that. I think its a great thread guys, and please carry on with your postings for us Brits. yup, cheers for the thread guys. I'm intrigued by the foot rest / warmer you guys have on the passenger side. Obviously for me that's going to be under my clutch foot. I jumped into a pre production model and was immediately horrified by the size of the thing, but a week later when i got to sit in a euro spec model it seemed far less noticable, perhaps even comfortable. It got me wondering has the size of the lump been reduced or is it the aluminium pedal set with foot rest? Trunk release is not just decorative.......some people will climb in anywhere! Fine thread !!! We also have a Miata, no comparison the engine fells like a washing machine, and nowhere near the refinemet of the 8. It's still fun, but not the in the same way. All the items mentioned before should mute some of the HP racer wannabee's and appreciate the auto for what it is, a fine sports car that is also a piece of rolling art. All great things that I love about the car, but I'm surprised no one mentioned this one factor that my wife and I still marvel at. What about the attention this great car gets? Mine started when I picked the car up at the dealer. A reporter showed up to write an article on the car and how I came to choose it. After that, no matter where you go, people come up to talk about the car. We've all experienced people driving by us and slowing down to look at the car and give back big smiles. I've had many people come to look and talk who had no clue at all about the RX-8 or the rotary. They just loved the looks and wanted to get a closer look. 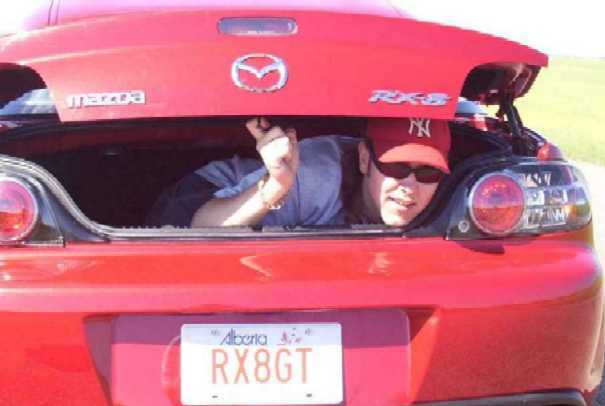 The reasons I chose the RX-8 was to have a car that was extremely fun to drive, handled well, looked great, and one that was very unique. I know I got the right one! The AC starts cooling everything immediately, even if you're in the back seat. Never had a car where the back seat was as cool as the front almost immediately. The accelerator and brake are perfect for heel-toeing, even for someone like me with size 6 shoes. The accelerator and brake are perfect for hell-toeing, even for someone like me with size 6 shoes. More good points. Thanks, Elara. I'd like to learn more about "hell-toeing." Is it anything like heel-and-toe? Sounds bad. People I wanted to say that when we were presented with the options from Mazda this last friday, I took the buy-back option very seriosely because I always like to play the devils advocate and analyze all my options. So this weekend, slightly disheartened about my car, I went to Nissan to go see the Z (which I also loved and considered a close second), the BMW 330Ci, and the Infinity G35, and when I considered the factors involved in each of these cars, i came to realize that the Rx8 was indeed the car for me. It may not be the fastest, but there is no doubt in my mind that it is the most equillabrated and is the perfect car for ME. I just cannot get over the attention that this car brings. I live in a downtown with street parking. I can see my 8 directly out the window and on any given day cars creep by admiring it. I even saw a Camry back up, stop, and proceed stare at it for like 5 minutes this morning. Not many other 30K cars will acheive this result! Second post, I mentioned it makes you feel like a superstar.... That's what I meant. There as so many things listed here, thing I have taken for granted. Although I didn't know the AUS get climate control? The AC is FAST at cooling off, although today I noticed the cycling although it didn't bother me it was odd. One neat little thing I noticed while sitting at a long red light today, the sun visors each have small slot on one side so you can tuck a toll booth ticket or something in there to keep safe. I'm not sure if that's the intended use, but it works for me. Way cool. I've been driving over a month and never noticed. I went back to look and sure enough. I have to keep a pass with me to get on military bases, and I never had a good place to put it till now. Into the visor slot it goes! Thanks. This is a repeat, but I really do like the visors. They are so clean, simple and sturdy. I get tired of the padded, upholstered ones that tear and get dirty; these are just plain plastic that'll wipe clean if needed but still look classy. For those who haven't seen 'em, the two ends are perforated with tiny holes. They'll block the sun from blinding you while still letting you see the traffic light right through the holes. Damn clever! Great thread. Three pages and no troll crap to wade through. I love all the little and the not so little things about this car that this thread has mentioned. Heres one that really sets it apart for me. The center console is ergonomically correct for your arm to rest there without your shoulder being pushed up or drooping excessively down. No more pain on long drives. Last edited by P00Man; 04-16-2011 at 07:55 PM. When the car is wet and you open the trunk, all the standing water is channeled away. No water spills into the trunk. Here's another one. I saw my car when it was on the transport truck, and for the first 3 feet underneath the nose it has a plastic shroud, back to about the front axle. Should keep a lot of road dirt and debris from the engine compartment. All of the hoses and plumbing running along the bottom is layed out perfectly. Just because you can't see it doesn't mean Mazda did not put a lot of time and energy into the design. Put your car on a lift, or go look at it during your first oil change, you will be amazed. The bottom is a work of art. Last edited by P00Man; 04-16-2011 at 07:56 PM. The first time you redlined it after the 600 mile "break-in". That was 1000+ miles ago but it's still brings a smile to my face everytime I take it to redline. Something I found handy today.... When the car is parked in the garage and you have the windows down, you can reach in and change track and volume using the steering wheel controls instead of having to reach all the way to the console. Ah yes that is usefull! Also you can open close the windows with the key out before you open a door. I like the fact that I NEVER have to use my key, I have yet to use it on the car. No key scratches this way! how about the safety features- the window tabs have to be pulled up when closing the windows to avoid accidental closing if your arm hits the door (several children have been killed by catching their heads in windows) and the lack of a keyhole on the passenger side door. The engine is obviously a mechanical marvel. But, I appreciate the engineering efforts Mazda put into the WHOLE automobile, as opposed to building an auto 'around' the wonderful engine / transmission / handling. It appears the company made a supreme effort not to overlook the nit-picky detaily things that elevate a car to a class of superior, "refined" automobile. Stated another way, I view the '8' similar to a very complicated jigsaw puzzle. From my perspective during the month I've owned my '8', the many 'pieces of the puzzle' have been well thought out, cleverly integrated and crafted to 'fit' and complement all the many other 'pieces' of the vehicle puzzle. All the "little things" function together to make the WHOLE of the automobile an outstanding piece of craftsmanship. Every time I drive my '8' I am 'wow'd' by some aspect of the car I hadn't seen before.